Once a stop on the Chicago turnpike (US 12), Moscow was always a small town, earning itself the nickname Sleepy Hollow. 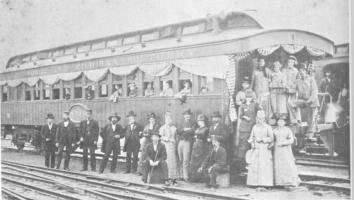 Even the advent of a railroad depot for the Michigan and Ohio Railroad didn't produce the boom expected though Moscow. The depot, which had two rooms, handled mail, freight and passengers for the four trains that passed through each day on the Michigan and Ohio Railroad's Allegan-Toledo Line (two trains carried freight and two carried passengers). The Cincinnati, Jackson and Mackinaw Railroad purchased the railroad and depot in 1997. Today the depot serves as the Moscow Township Hall.